Discernible difference On December 6-7, 1996, a meeting was held at Kailadevi -- a 674-sq km sanctuary situated in the north of Ranthambhore national park in Rajasthan. The meeting, organised to explore the possibilities of involving local people in the management of the park, highlighted instead the total disinterest of the forest department in the matter. Despite repeated assurances of participation, no forest department official attended the meeting, effectively styming the progress of the dialogue between the local people and the department. The villagers were so piqued that they even wrote a letter to the chief minister of Rajasthan, expressing their resentment at what they considered an insult. The absence of the forest department's representative, however, did not stop the villagers from coming up with recommendations for the conservation of the sanctuary. Besides facing intense grazing pressures from its adjoining villages, the forest also faces an assault from migrant sheep -- numbering about 1.5 lakh -- for about eight months every year. This, coupled with the local people's dependence on the forest, has led to massive degradation and acute shortage of fuelwood, fodder and other resources, besides a perpetual water shortage. To mitigate the effects, the villagers recommended a survey of the possibilities of constructing anicuts, small dams and borewells, which are to be used not only for livestock and drinking but also for irrigation. They also suggested, among other things, that strong fences be built around the fields to check crop raiding by wild animals. Earlier, some of the villages in the region had formed a group called the kulhari panchayat, to check illegal felling of trees. Strict laws were framed and heavy fines imposed on people breaking them. Villagers themselves have reported on the lawbreakers. In the December meeting, the villagers said that violators should be made to pay fines, even if the forest department does not impose penalties on them. The patel (headperson) of Lakhuti, one of the villages in the area, says, "We strictly adhere to the laws. Once, a forest guard was seen by one of the villagers taking away thicker branches than were allowed. The gram sabha (village council) not only forced him to give up the wood, he also had to pay fines as required." The pujari (priest) of the village recounted another incident: once a forest officer asked the villagers to cut some of the trees on both sides of the road, so that wildlife could be sighted more easily and there would be less chance of their accidentally colliding with vehicles. The villagers categorically told him that cutting the required number of trees amounted to a fine of nearly Rs 17,000. Evidence of regeneration in the area, owing to these efforts, is apparent. Coincidentally, since this initiative was taken by the villagers, the region has been experiencing good rainfall. Even though there is no evidence of a direct correlation between this and the improved forest cover, the villagers are convinced that it is a direct result. Many neighbouring villages, inspired by Lakhuti's example, have started similar ventures. Ironically, the enthusiasm of a local forest officer could have resulted in this initiative being nipped in the bud. Conceptualising how people could participate with the forest department in protecting their forests, he initiated forest protection committees (fpcs) in villages. These fpcs were different from the gram sabhas and were to take decisions that pertained only to village forests. Each fpc was to have a representative of the department -- the provision that created all the trouble. Explains Lakhuti's patel, "As it is necessary for the department's representative to be present, we have had no meeting of the fpc since then. Too many formalities are required in this kind of set-up. The informal meetings of the gram sabha are much more efficient." Another example of people's initiatives making a discernible difference: the people of Bhanvta and Koylata, two villages near Sariska, Rajasthan, have conserved 1,200 hectares (ha) of forests through their own initiative and traditional institutions. What began as a quest to resolve the water shortage in these villages in the degraded hills of the Aravallis, culminated in the understanding that water issues are closely linked with forests and the answer to shortage of fodder and fuelwood lay in protecting the village forests. With a local organisation, the Tarun Bharat Sangh, playing the key role in creating awareness and giving support, the people took upon regenerating their forests. In 1988, these two villages, along with the neighbouring hamlets of Khatala, Khardata and Dumoli, decided to preserve their village forests. Strict rules were made, the violations of which were to be immediately reported to the gram sabhas. The villages now have adequate fodder and face no shortage of dry wood for fuel. Grazing continues, but under strict monitoring of the sabhas. In fact, one of the villages has handed the responsibility of protection of the forest to their cattle herder community, members of which regularly go into the forests. The story does not end here. The villagers have decided that they would like their forests to be as well known as Sariska and, in a traditional ceremony, have named the forest area the Bhairon Dev 'Sonchiri', after their forest god. They claim that a lot of wildlife now resides in these 1,200 ha of forests and say that tourists should come and visit this area as they do in Sariska. On January 20, the Karnataka High Court, deciding on a petition by the Nagarhole Budakattu Hakku Sthapana Samiti -- a local ngo-- against the construction of a wildlife resort by the Taj group of hotels, held that leasing of forest land and buildings in the Nagarhole national park was illegal and asked the Taj group to stop construction activity immediately. The court held that the contentions of the respondents (the Taj group and the Karnataka government) were invalid and ordered them to pay Rs 10,000 towards costs to the petitioners. The petition is a part of the local people's agitation for the right to regulate the use of the forest's resources. In recent meetings, the tribals have reiterated their demand for self-rule. It was decided that the supporting ngos would play a peripheral role. To bolster their efforts, a strong network is being developed through intensive grassroot campaigning. Nagarhole is a classic example of people tiring of waiting and becoming desperate. In December 1995, approximately 4,000 tribals from all the eight forest ranges in the region of the Nagarhole national park in Karnataka forcibly entered the forest in a show of defiance. As the forest officials looked on, the tribals walked into the core to worship in the temples (there are 58 temples in Nagarhole). They then decided to symbolically collect their traditional forest produce such as honey and gooseberry. The tribals then decided to repeat this gesture every week to maintain the pressure on the authorities. Such actions have yet to bear fruit. The forest department's shortsightedness also came to the fore in the northern-most bastion of the Asiatic elephant and the tiger in India -- the Rajaji national park in the Shiwalik hills, of Uttar Pradesh. In an ambitious plan to relocate about 1,200 Van Gujjars, forest department officials built a resettlement colony at Pathri in the late '80s. But the Gujjars, a nomadic community that had made these forests their home, were not consulted and their lifestyles not taken into account when the colony was designed. Thus, when the procedures for resettlement began soon thereafter, the nomads naturally rejected the colony. Not that the colony of a mere 1,200 would have made much of a difference to conservation efforts anyway. There are about 5,500 Gujjars with 12,300 buffaloes living inside the 800 sq km park. Besides, a majority of the Gujjars migrate to the upper Himalayan mountains in the summer and monsoon seasons in search of pastures, in effect allowing the forests to recoup and regenerate. Besides the Gujjars, there are the nine Taungya villages inside the park. Taungyas are people who were encouraged to settle in Rajaji by the state forest department in the 1930s as labour for plantations. The plantation activities ceased in the '80s, but the Taungyas stayed on. Apart from this, there are 19 villages with 2,500 families within the park boundary and another 100 villages housing 1.65 lakh people in a 10-km radius around the boundary. These villages utilise the resources of the park to varying degrees. Among the pressures the park has been facing is largescale encroachment, mostly from government infrastructure, and an expanding neighbouring township of Haridwar. 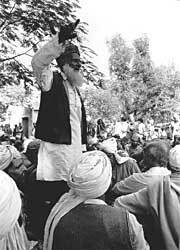 The Gujjars, facing displacement, have belligerently demanded their rights to stay inside the forest and sustainably use and protect it as they have been doing through the years. In an incident involving the use of bhabbar grass, on which the local people depend for their livelihood, a clash reportedly took place on December 2, 1996, in the Chilawali range of the park. Residents of Banjarewala village situated outside the park apparently clashed with some Gujjars of the range over stocks of the grass that had already been cut by the latter. Another case of an endless wait is the Padre village in Rajasthan's Ranthambhore district, which is located inside the core of the national park there along with three other villages -- Mordungri, Indala and Kathuli. Comprising 50 families, Padra village once had collectively 950 bighas (a measure of land varying locally between 1/8 to 2/5 ha) of cultivable land. Since the inception of the national park, most of this land has been taken away by the forest department. Only about 16 people have pattas (rights) for their land, the rest being landless labourers. Cut off from civilisation, with no access to roads, electricity, schools or markets, the villagers are desperate to be shifted out of the core. Nainji, an elder of the village says, "For the last five years the forest department has promised to shift us and told us that we should not construct any new house or dig any wells because these new constructions will not be compensated at the time of relocation." Extremely apprehensive about their future and antagonistic to the national park, which they see as the villain of the piece, the villagers continue to struggle through life, waiting for someone to take a decision.